Can I pick up my order from your store/location? Do you offer special program and pricing for Governmental Agencies official orders? 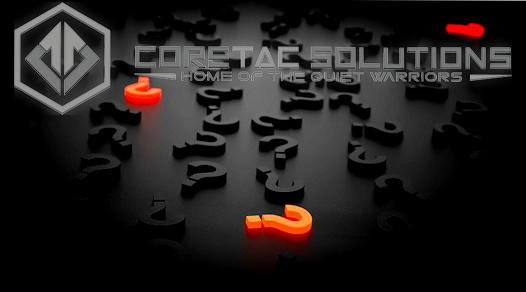 How secure is the CORETAC SOLUTIONS website? Do I need a PayPal account for check out and payment? What is Interac Email Money Transfer (EMT)? How do I send an Interac Email Money Transfer (EMT)? Do I have to pay taxes and how much? What if I have problem with a product? How do you conduct product tests? How do you select products, product lines and manufacturers? We do not have a store front. All orders must be placed online; however, we'll be more than happy to answer any technical questions you might have by email or over the phone. We stock all our products and ship according to the advertised timeframe for that item. If a product is Out-of-stock, it will not be included during the "Check Out" and it will be marked as "Sold Out" with description of the item(s). Add the items you want to purchase to your shopping cart. You can view or update your shopping cart at anytime during your stay. Once you are ready to check out, simply enter your PayPal account and complete your shopping. If you don't have a PayPal account you can enter your information and pay by one of the major credit cards such as Visa or Master Card. You do not need a PayPal account to complete your purchase. No, all orders must be placed on-line. We use a comprehensive and secure E-Commerce shopping facility with real time inventory system. If you have any technical or product specific questions, we'll be more than happy to answer them over the phone. We do not have a storefront and our warehouses are closed to the public. We offer special pricing, quotations, expedited shipping methods, unique product selections such as color and features to Armed Forces, Law Enforcement, and Government security agencies. Please (contact us) for more detail. You can click on "PayPal Check Out" button to use your PayPal account and complete the payment. If you don't have a PayPal account, You can click on "Check Out" button. You can enter your information and pay by major credit cards such as Visa and Master Card. You do not need a PayPal account to pay by credit card. Our website is secured via the toughest and most sophisticated available security products from GeoTrust. GeoTrust® is the world's second largest digital certificate provider. More than 100,000 customers in over 150 countries trust GeoTrust to secure online transactions and conduct business over the Internet. Their range of digital certificate and trust products enable organizations of all sizes to maximize the security of their digital transactions cost-effectively. PayPal is designed from the ground up to be one of the safest ways to shop online. Unlike other financial institutions, PayPal payments are sent without sharing financial information. In fact, PayPal never shares your financial information with or sells it to merchants. Your personal information is stored on PayPal servers and heavily guarded, both physically and electronically. Safeguarding your financial and personal information is one of our most important priorities. That’s why PayPal automatically encrypt all sensitive information sent between your computer and their servers. Do I need a PayPal Account to checkout and Payment? If you don't have a PayPal account, you can click on "Check Out" button during check out. You can then enter your information and pay with major credit cards as a guest. You do not need a PayPal account to pay by credit card. Interac Email Money Transfer – just like sending cash, only now it’s done electronically Interac Email Money Transfers are a simple, convenient, and secure way to send and receive money directly from one bank account to another. All you need is access to online banking through participating financial institutions, and you can send money to anyone with an email address and a bank account in Canada — without sharing any personal or financial information. It's a great alternative to cheques and cash. With Interac Email Money Transfers, your money never actually travels by email. Email is only used to notify the recipient and to provide them with instructions on how to deposit money. Your financial institution and your recipient’s financial institution transfer funds using established and secure banking procedures. As a sender - Interac Email Money Transfer confirmation numbers are saved in your online banking history. In addition, you will receive an email notification once the intended recipient has accepted the transfer. As a recipient - You will receive an email notification when the transfer is sent, indicating the amount as well as instructions for depositing it. All Canadian residents will be required to pay Canadian taxes. All Orders (except optics/scopes) will be shipped with Canada Post Expedited Shipping, which includes Shipping & Handling, Insurance, and Tracking Number. The tracking number will be emailed once your order has been shipped. We do not guarantee the delivery time of Canada Post once the order is shipped. We will do our best to resolve any delays or non-delivery issues with Canada Post. In-stock items are shipped within the advertised time as per item when full payment has been made and cleared for processing. Items that are not in-stock will be shipped when they arrive. CORETAC SOLUTIONS INC. may choose to hold your order if out-of-stock item(s) can be shipped together with in-stock item(s). We will ship your complete order when all item(s) are in-stock. You can track your orders at Canada Post Website. All orders including scopes/optics such as Tangent Theta, Kahles, Schmidt & Bender, SIG Optics, and ELCAN will be shipped via FedEx Express Air Service. You can track your orders at FedEx Express Website. CORETAC SOLUTIONS INC. generally only ships within Canada; however, some products can be shipped to the USA. Please look for this sign for exportable items to USA. As for other countries we do not ship outside of North America. All Parcel Orders will be shipped with Canada Post Expedited Shipping, which includes Shipping & Handling, Insurance, and Tracking Number. The tracking number will be emailed once your order has been shipped. Due to the nature of our products we do not accept product returns or exchanges. Depending on the problem, we'll try to resolve the issue or present your case to the appropriate manufacturer within 1-2 business days. CORETAC SOLUTIONS INC. will not give out your personal information (e.g. Name, Address, Email etc.) to anyone. We only use your information for Shipping Products and/or Information Updates. All goods are as received from the manufacturer. Full manufacturer warranty applies. Please read manufacturer's manual for warranty information upon arrival of your order. CORETAC SOLUTIONS INC. will help exchange defective product(s). Warranty does not cover shipping charges, misuse of the products or damages during installation. CORETAC SOLUTIONS INC. advocates complete safety when dealing with Firearm products. CORETAC SOLUTIONS INC. is not responsible for any matter of injury (or injuries), action(s), accident(s) caused by the products that we sell here. The user(s), buyer(s), parent(s) and/or guardian(s) (if user is under 18years old) must ensure the safety and proper usage of the product. CORETAC SOLUTIONS INC. advises that the user(s) read the Manufacture’s Manual for proper usage safety and maintenance instructions. CORETAC SOLUTIONS INC. is not responsible for any matters regarding safety once the product(s) have been sold. By purchasing from CORETAC SOLUTIONS INC, and/or viewing this web site; you agree to these Polices and Terms & Conditions. CORETAC SOLUTIONS INC. has the right to change its Terms and Conditions at any given time. CORETAC SOLUTIONS INC. is not responsible for errors or omissions on this web site. We conduct the majority of our tests in the field over an extended period of time. We believe there is no substitution for field tests. Although tests in control environments have their own applications, they can not replace field tests. Field tests often subject the equipment to multiple conditions (temperature, moisture, UV, pressure, weight, etc.) at the same time. We accomplish our field tests through various methods such our staff’s personal use in the field and in the competition environment; feedback and questionnaire follow up from our (Trial and Assessment program) and finally feedback from our test customers. These types of tests are conducted where field tests are not applicable or hard to carry out. In many instances, we conduct these tests in addition to our field tests. These tests include stress simulation such as pressure, drops, water submersion, heat and cold exposures. This is always combined with other types of tests. There is a lot of misinformation out there, so we tend to use this type of data as a verifier or as a starting point to other types of tests. We use our collective experiences & knowledge base, the price performance and quality of each individual product to assist us in the selection process. In addition, we give priority to manufacturers that are committed to innovation and to working with us to serve our customers better. We pick products that pass our tests and overall criterion (see our test section). We don’t simply pick a company or product line just because they have a few quality items or just for having a large following in the industry. Our commitment and loyalty lie with our customers. We go the extra mile to work with manufacturers to verify the quality, oversee the quality assurance, and offer exclusive higher quality material in our products. For example, we might work with manufacturers and suppliers to exclusively offer products made from 1000 Denier Cordura vs. 600 Denier Cordura, use material with 4mm vs. 6mm of thickness or offer KG Gun Coat vs. Anodize coating. Although our selection process is very time consuming and costly, it provides our customers with peace of mind knowing that we have done our part and they don’t have to go through the trial and error. If you need more detail information regarding the quality and construction of any of our products you can contact us.